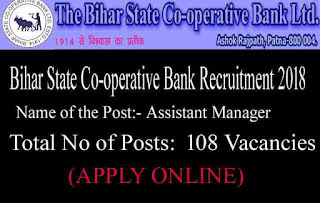 Bihar State Cooperative Bank recruitment for Assistant Manager Posts. Cooperative Bank Recruitment department is appealing all Indian fresher applicants to apply for Assistant Manager job profiles. Cooperative Bank Recruitment department is looking to fill up total 108 vacant job profiles of Assistant Manager in the various branches of the bank. This one is indeed a good opening for all fresher Graduates to grab a Government sector Bank job in India. More information related to this Cooperative Bank Recruitment process is given below in this article. We personally took this information from the official PDF file shared by the bank on their Official website only. We also share the official LINK under IMPORTANT LINK section at the last of this article. Pay Band: Rs.23,700 – 42,020 per Month. 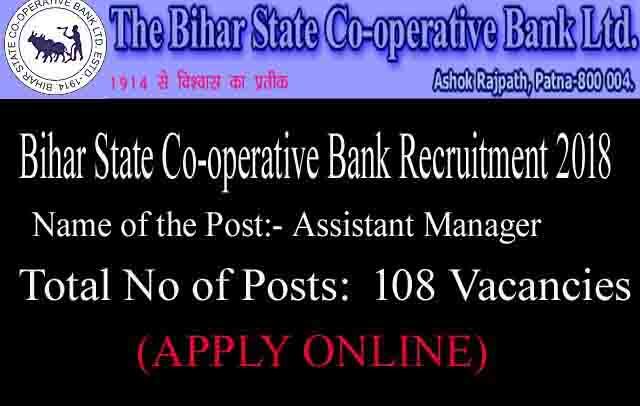 Education: Applicants having a Bachelor degree in any trade/stream can apply for this Bihar State Co-operative Bank Recruitment 2018.All fresher candidates can apply for these Bank jobs in India for Assistant job profile. Age Bond: Must have applicant age in between 21 years to 33 years. That means the minimum age for applying is 21 years and the upper age limit up to which candidates can apply is 33 years. Paying Method: The applicants have to pay the application fee given in the above table through the online method only. The various method for the payment of the application fee are: “ Debit Card/Credit Card/Net Banking”. The method for applying these Cooperative bank recruitment process is ONLINE through the official website. There is no other method for applying this Bihar State Cooperative bank recruitment process 2018. We also share the link under IMPORTANT LINK section for online application form. The link for applying online will be activated on 26th Oct. 2018 and will remain activated up to 22nd Nov. 2018. So you have to apply online between these dates. 26TH Oct. 2018 is the Opening Date. 22nd Nov. 2018 is the Last date to apply.